A big giant red lobster handed me the menu for an Urban Lobster Shack while passing through 3rd Ave the other day. What a great idea, Crystal Pavilion already has Pampano Taqueria but as any food loving blogger, I was ready to welcome this new addition with open arms. So much so, that I started following them on Twitter. 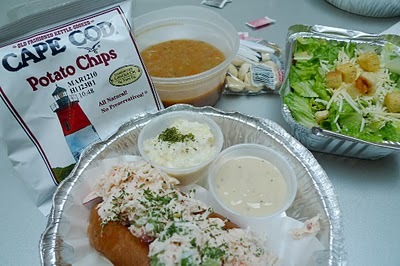 I grabbed my Lobster Roll virgin co-worker Nancy and headed over for the $10 special, 1 lobster roll, cole slaw, caesar salad. 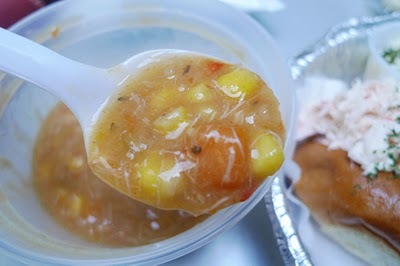 We also shared a Spicy Crab and Sweet Corn Chowder for $6. Sitting by the modern waterfall (which makes me a little dizzy if I stare for too long), my expectation and excitement were hard to contain. The roll part was awesomely yummy, grilled and totally emerged in butter, it would make Paula Deen proud. The lobster on the other hand, had a little too much mayo. If only Luke’s and this place could combine, it would be perfect. 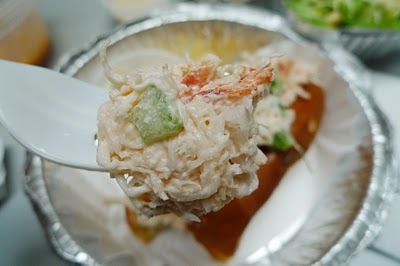 Mayo aside, this “lobster” roll had an even bigger mystery… where’s the lobster meat!? After digging around, I found no more than 4 pieces. I know lobster isn’t cheap and $10 seems like a good deal, but I want lobster chunks in my lobster roll, not shredded lobster mixed with some crab meat, then masked with mayo. I’d rather pay a little extra for non-filler lobster rolls please! This was soooo disappointing and I really wanted to love this place. 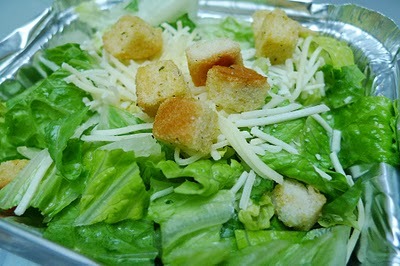 As if that wasn’t enough, the caesar salad came with stale croutons. I would of been happier without. The coleslaw was aight, nothing worth describing. After this experience, I’ve been avoiding that big red lobster on street corners. 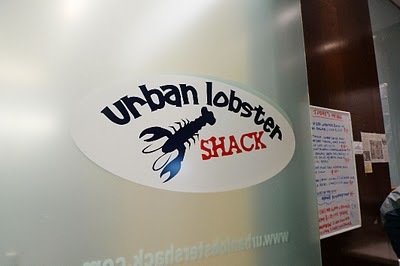 An Urban Lobster Shack in midtown… I knew it was too good to be true. I had to stop following them on Twitter, it’s sad, but what can I do. Too bad. I've heard good things about this place, but that lobster roll with too much filling is disappointing. The reason you've heard great things about this place is because it's great. My office is in the same building (805 Third) and Urban Lobster Shack has become our choice for lunch as a group of 14 in my dept/section AT LEAST twice a week. 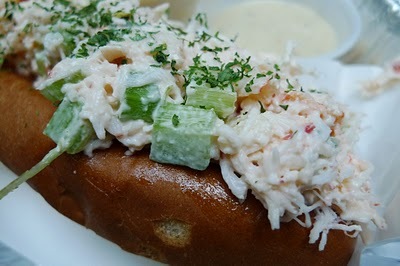 There is never anything but lobster some mayo and some celery in the roll. Sorry, but I feel this is a very misleading review! Maybe when u guys order it… they put more lobster in it… BUT… I'm not trying to mislead anyone here, I have nothing against them… and like I said, I wanted to like them…. but PICTURES DON'T LIE, look at the pictures I took of the roll, see any chunks?… compare that CerTe's, Ed's lobster bar or even Lukes! I'm not exaggerating when I say this. Good thing you remind me about the flaws of this place. Marketing strategies can be deceiving. In most cases, you must try first try eating in a restaurant to find out the quality of food that they are serving.